This lesson introduces learners to the challenges in predicting precipitation associated with tropical cyclones (TCs). 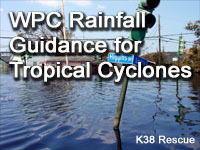 It also provides an overview of the deterministic and probabilistic rainfall guidance products issued by the Weather Prediction Center (WPC) to forecast TC-related precipitation. Learners work through a TC case to practice interpreting the guidance correctly and communicating the precipitation threat. The lesson also highlights the different interpretations of probabilistic products from the WPC and National Hurricane Center, and the need for collaboration between national centers to ensure a unified message. The in-lesson questions really helped to absorb the information and thus remember the information for the quiz. Good primer on PQPFs. I learned a little about how they are created, and I learned how to use them. My pre-assessment was 75 then first attempt 66 then second time 84% That seems weird to me. The discussion of various models and components of the forecasts was valuable, but if they truly are important to understanding the actual forecasts from an emergency management perspective more time needs to be spent on describing what they are and what they do. My missed questions all dealt with exactly which tools were used to generate which forecast - I answered every question involving actual interpretation of the data correctly. And that is what seems to me to be critical. A minor point, but an explanation of where the values start and where they stop for each color might be useful - it took me a couple of charts to figure it out. I am sitting after morning coffee wondering how much rain will fall in Chapel Hill, NC on Tuesday 12SEP2017 due to IRMA which is now inland over Alabama and Tenn. This module was very interesting because I have been responsible of determining if the meeting for tonight needs to be cancelled. I told everyone last night that the meeting should not be adversely affected by the rain, which I expect to taper off this afternoon. Really difficult for folks with color vision deficiency using the graphics provided in the lesson. My issue with the test was that I live in an area that doesn't see many TCs and I found the info to be unfamiliar based on no experience. Otherwise I would recommend the test to others because it was very informative. Like very much the booster questions subscription idea/initiative to keep me up-to date with lessons and new topics. I run two FB weather pages for the Tampa Bay area. While I am not a met, I am trying to learn more to provide a better service to our community. These courses are great for learning topics that apply to your particular situation. Since I live in an area where weather can and does change by the minute, I need to be able to use all of the resources available to me. Opens up asking the reader to assess the rainfall forecast. It was a good forecast, not very good as subjectively stated in the material. Excellent information on how to predict rainfall and flash flood potential associated with tropical cyclones. It was a challenging course but improved my knowledge a lot. Applicable information and well put together in terms of instructional design. Overall this module was fantastic which is why I'm giving it 5 stars, however when I went to do the survey using the new MetEd survey form it would not let me submit it. Therefore I had to use the old system to get my certificate. Describe the unique challenges of tropical cyclone QPF. Explain how the WPC QPF and PQPF are created and how to interpret their output. Differentiate between the way WPC and NHC use probabilities in their products. Identify which products complement deterministic QPF by offering information about forecaster confidence, worst-case scenarios and message highlights. Identify three high-resolution tools (other than flash flood guidance) which influence the WPC Excessive Rainfall Outlooks. The content of the lesson was updated in the summer of 2018. The "Deterministic QPF" section was updated to state that WPC no longer shows the QPF maximum on web images. The "PQPF" section was updated with a list of new ensemble members. The pre-test and quiz were updated accordingly.